TOKOLOSH is the coming together of a collection of Manchester musicians, Christian and Nicky Madden and Richard Young from The Earlies, Nathan Sudders from The Whip and Liam Frost. Liam, who is the band’s sole lyricist, describes the lyrical content of the songs as “a slant on the desperate and obsessive nature of love and adult relationships” and admits they are somewhat darker than his solo recordings. A collision of soul, R&B, heavy tribal rhythms, and driving punk bass, spiced with prog, TOKOLOSH is the perfect name for a band whose music has a deep darkness at its heart cut through with a kind of magical and often sinister air. That darkness translates to the band’s artwork which has been created by Marc Atkins, renowned as an artist, photographer, designer and videographer, who has collaborated on many occasions with the art director, Vaughan Oliver. The band’s live shows will translate that aesthetic to the stage with Atkins creating live projections to go with the sound. 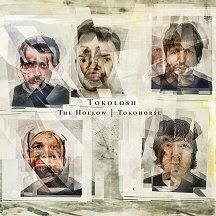 The band’s first release “The Hollow/TOKOHORSE” shows the two sides of their sounds – dark and heavy on The Hollow and more beats and groove-orientated on TOKOHORSE, and is set for release on Static Caravan in October, as the first of three 7” limited editions. TOKOLOSH plan to play carefully selected shows, as Liam puts it, “we’ll stay off the Barfly circuit”. They will focus instead on more unusual venues such as the John Ryland’s Library in Manchester where the group recently played. 300 copies only on 7” and pressed onto grey wax.